Come down to Pigeon Forge for guaranteed star sightings at the Hollywood Wax Museum; with realistic wax replicas of your favorite actors and musicians, this attraction is perfect for any fan. Here, you can see your favorite stars in full costume on a well-known set, or dressed to the nines in Red Carpet glamour and style, waiting for you--their star-studded guest--to strike a pose with them for the camera! This two-story museum is filled with characters and actors from beloved films and shows, from romantic comedies to horror and sci-fi. You will get tons of information and photo opportunities with replicas of famous celebrities, musicians, actors, and more. This museum is perfect for the whole family, who will have a great time taking photos with some of their favorites. Your admission ticket grants you the opportunity to not only experience all of the fun at the Hollywood Wax Museum, but also the Castle of Chaos, Outbreak - Dread the Undead, and Hannah's Maze of Mirrors. Where else can you see actors, musicians, and celebrities in the same place? 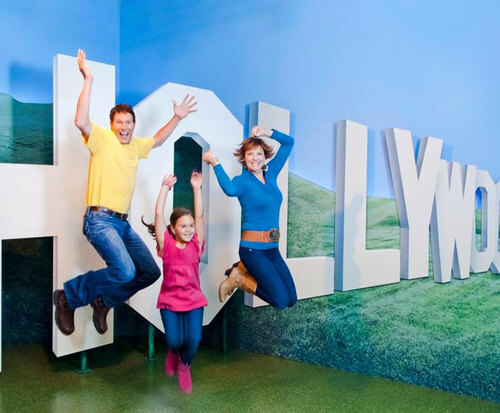 Visit the Hollywood Wax Museum for great fun and plenty of photo ops. The All Access Pass allows you to to attend Hannah's Maze of Mirrors, Hollywood Wax Museum, Outbreak - Dread the Undead and Castle of Chaos. What is included in the admission price for Hollywood Wax Museum? Approximately how long could a customer plan to spend at Hollywood Wax Museum? Is Hollywood Wax Museum handicap accessible? For what ages is Hollywood Wax Museum appropriate? Is parking available at Hollywood Wax Museum? Is it free? "we had the best time ever"
Many, many different stars to see. This was one of our favorite attractions. We were able to pose with all the figures and we had the best time ever. We really enjoyed everything we had scene in there. The displays were very accurate and details were amazing. We enjoy the pics we took and all the souvenirs available. All the people that serviced us there were superb. "Loved it very real like"
"Great job on most figures ."